General Mills is on a journey to always make our cereals better. 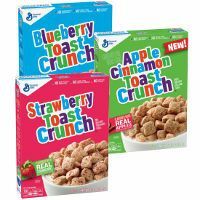 That's why Strawberry Toast Crunch Cereal has no artificial flavors or colors from artificial sources, no high fructose corn syrup and whole grain as the first ingredient. General Mills Big G cereals contain more whole grain than any other single ingredient.